Make sure you contact AMG Export at sales@marvitec.com for all fo your welding needs. 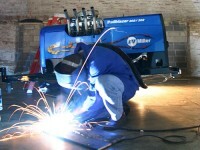 Miller Engine Driven Welders are some of the most reliable, durable and economical welders/generators in the world. AMG Export carries the Bluestar®, Bobcat™, Trailblazer®, Pipe Pro™ and Big Blue® series of Miller engine drives. Every component in a Miller industrial engine drive is engineered and built to assure ultimate reliability in the most punishing conditions. What makes Miller Industrial Engine Drives so Tough? Miller Engine Driven Welders are Designed and built with reliable, heavy-duty industrial components that allow operation in remote locations,without downtime. Miller Engine Driven Welders have anEnclosed robust case design protects internal components from impact and allows air flow to cool and prolong the life of the engine. Also reduces sound levels. Miller Engine Driven Welders feature a “Vault-ultimate control board” reliability in CC/CV models. Hardened solid-state control technology, housed in a sealed vault. The vault’s sealed connections are made through watertight plugs that make these components impenetrable to dust and moisture.Miller Engine Driven Welder’s Hot Start™ provides positive Stick electrode starts to make it easy to start all types of electrodes, and works great for bead tie-ins. Miller Engine Driven Welder’s Arc-Drive technology makes the welding easy. Automatically enhances Stick welding, especially on pipe, by focusing the arc and preventing the electrode from going out. Miller Engine Driven Welders boast a 5500-watt peak generator power that is independent of weld settings which means no interaction between tools and the welding arc. Quick and easy maintenance with single-side access to oil level check, oil fill, oil filter, fuel filter and air cleaner. Miller Engine Driven Welders are CSA and NEMA compliant. Automatic engine shutdown protects engine if low oil pressure or high coolant temperature occurs. Can’t Find A Specific Product?